Likud MK bashes far-left party for traveling to Rwanda in attempt to scuttle Israel's plans to deport African migrants. MK Dr. Anat Berko (Likud) blasted members of the far-left Meretz party who traveled to Rwanda in an attempt to scuttle Israel's plans to forcibly transfer thousands of African migrants. Meretz MKs Mossi Raz and Michal Rozin had arrived at Rwanda's capital of Kigali this past Thursday in order to sway public opinion against Rwanda's agreement to foil Israel's plans to transfer illegal job-seeking infiltrators there. In an interview with Arutz Sheva, Berko noted that MKs Raz and Rozin had their trip funded by Germany's Rosa Luxembourg Foundation, which is known for funding radical NGOs that deny Israel's right to exist and pointed out that Meretz was the only party which opposed a bill she sponsored that attempted to crack down on Bedouin that steal weapons from IDF bases. 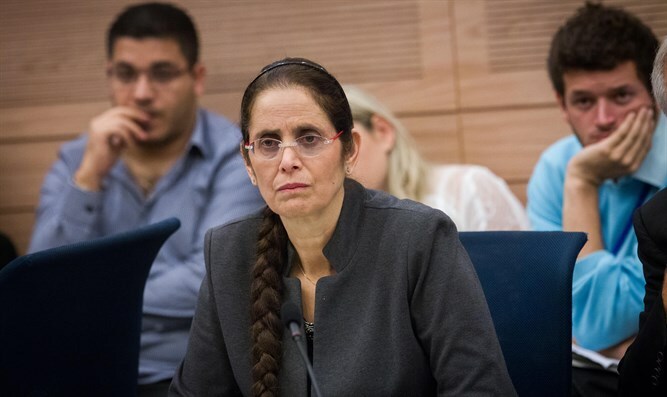 "What is interesting about Meretz, which is clearly an anti-Zionist party, is that they never vote for laws that help IDF soldiers but in my law to prevent weapons thefts, MK Raz was the only one who voted against it," said Berko. Berko said that the MKs should see the suffering that African migrants have caused South Tel Aviv residents before jetting off to Rwanda. "The High Court of Justice examined the entire issue and this delayed the entire solution for seven years yet they suddenly don't trust the High Court," charged Berko. Despite the Meretz Mks well-publicized visit to Rwanda, Israel Hayom reported that the visit did not go as planned, as Rwandan officials refused to meet with them. "Rwanda cannot be a playground for Israel's internal politics. We deal with governments and we only accept foreign officials who are recognized by their foreign ministry, "said Rwandan Foreign Minister Olivier Nduhangiri. "If every Israeli MK has a problem with his government regarding African immigrants who are in Israel, he has to deal with the Israeli government and not with Israel." Israel has been subjected to an increasingly vocal campaign urging the government to scuttle its plan to deport illegal African infiltrators. Under the plan, some 40,000 infiltrators who entered Israel illegally, mainly Eritreans and Sudanese, will have until the end of March to leave voluntarily with compensation. Anyone still in the country after that date will be arrested and deported without compensation. However, many left-wing public figures argued that the infiltrators should be allowed to stay on humanitarian grounds, arguing that Israel is effectively sending them to their deaths by transferring them to a third country. In an open letter last week, 36 Holocaust survivors called on the government to refrain from implementing the plan and likened the infiltrators to Jews who were refused asylum when attempting escape from the Nazis. Despite the protest, recent polls have shown that the majority of Israels support the plan to transfer the migrants to a third country. On Tuesday, the Israel Democracy Institute and Tel Aviv University published a "peace report" showing that 66% of all Israelis agree that the employment-seeking infiltrators should be returned to Africa as per the Israeli government's plan. The report also showed that 78% percent of right-wing voters support the plan, along with 35% of center voters and 25% of left-wing voters. Fifty-five percent of Israelis and 60% of Jews believe that despite the Jewish nation's history of suffering from persecution and violence, Israel should not show extra kindness to the employment-seeking African infiltrators. However, 50% of Israelis agree (and 43% do not agree) that the Israeli government must first of all check to see whether the Sudanese and Eritrean infiltrators' requests to remain in Israel are legitimate and to allow those whose requests are legitimate to remain.